Nestled between the countries of Germany and Belgium sits the quaint country of the Netherlands. 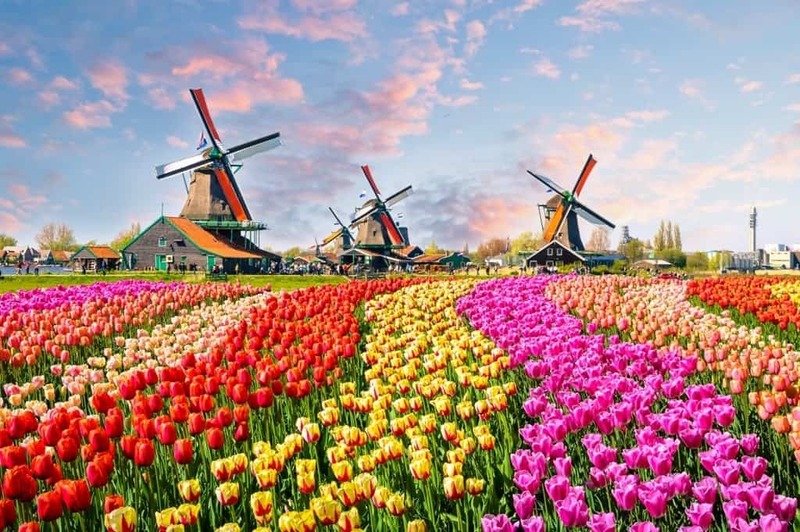 Also known as Holland, this country is filled with amazing places to visit as it’s rich in history and the arts. It’s also known for its collection of charming villages scattered throughout it. Many of them rest beside bubbling brooks or feature towering windmills surrounded by fields of colorful and fragrant tulips. 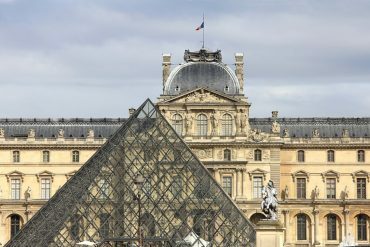 These villages are also often only a few minutes away from attractions like museums which you can visit after touring them. 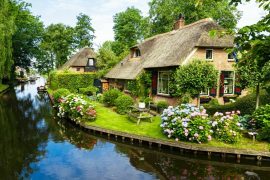 If you’re interested in checking out some of these villages for yourself, you’ll find some suggestions below of the most beautiful villages to venture to when visiting the Netherlands. Can you imagine anything more cute than a place with 19 Dutch windmills lined up in a lush green setting surrounded by water? 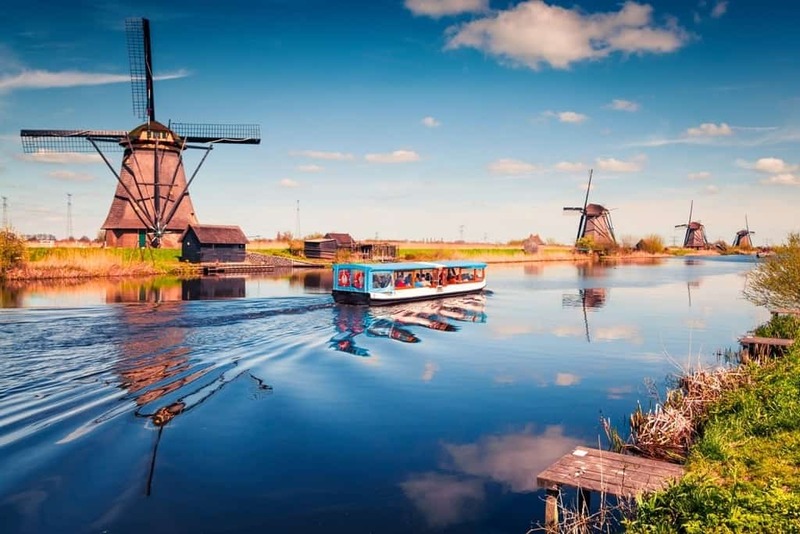 Near the city of Rotterdam, the second largest city of the Netherlands, you will find a village called Kinderdijk and this village is definitely one of the best places in the Netherlands to see windmills! The 19 windmills in Kinderdijk were built in 1739 and 1740 to prevent the area from floods and have been a UNESCO World Heritage site since 1997. Two of the windmills are open to the public and there’s also a visitor centre where you can learn more about watermanagement in the Netherlands. To get to Kinderdijk from Rotterdam Central station you can take a train to station Lombardijen and get on bus 90 from there. Another option is to take a boat or ‘waterbus’ from the centre of Rotterdam near the Erasmusbridge (look up ‘Veer Erasmusbrug’ in Google Maps). About 30 minutes later you will arrive in Kinderdijk. 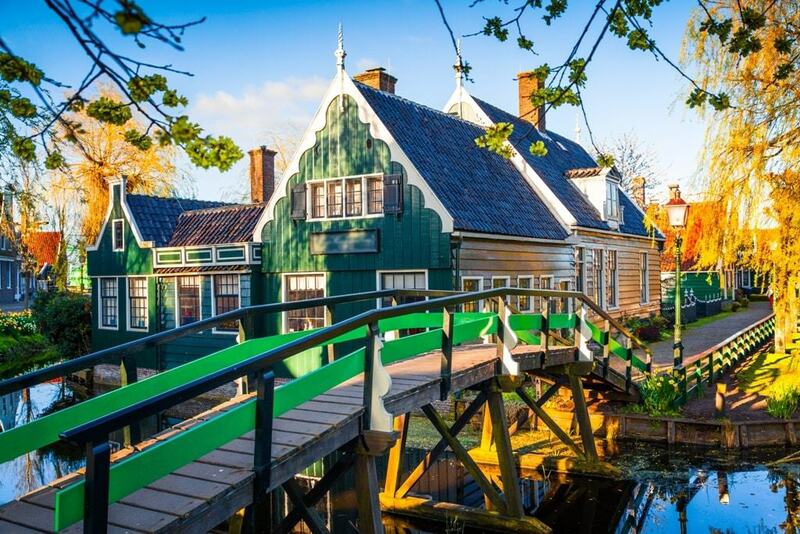 Zaanse Schans is one of the most visited villages in the Netherlands, for good reason. Visitors associate Holland with its windmills, and Zaanse Schans has plenty of the historic windmills and houses, most completed in the late 1500s to the 1600s. At one time, Zaanse Schans had more than 500 windmills along its canals. Sadly, most of them are long gone. While they’ve done a great job curating the village and the town as a modern day open air conservation area, they’ve also had to recreate many of the elements of Zaanse Schans to potray it as an ideal 19th century Dutch village. Nevertheless, it is a pleasant and picturesque town to explore. The best way to explore is on foot – though you can easily bike around or hop on a boat. Many of the windmills here have been meticulously restored (and relocated) and are now in working condition, producing oil and paint. You can visit each of the five mills for a small fee. You can even climb to the top of the mills. Each of the windmills has a unique character. My favorite is De Gekroonde Poelenburg – it’s easy to spot because of its its vivid green painted walls. There are also several museums and craft shops by the canal. My suggestion is to purchase the Zaanse Schans Card, where you can save money with free and discounted admissions. Lisse is a small town in the province of South Holland popular for the Keukenhof Gardens. 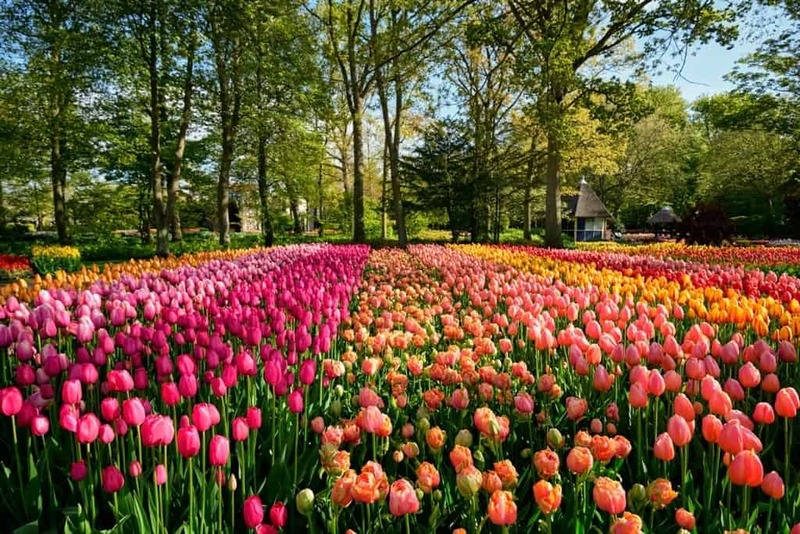 Every Spring thousands of tourists, as well as locals, head to the Keukenhof Gardens to enjoy the spectacular show of colorful tulip bloom. Also, do not miss the flower parade called the Bollenstreek Bloemencorso held every spring through the streets of Lisse. The gardens are located about 30-minute drive from Amsterdam which makes for a perfect day trip. The gardens are only open for few weeks from March end to Mid May. So if you are looking to visit in other months, there is a 17th century Keukenhof Castle in the garden premises which is open to the public all through the year. The castle can be explored through guided tours. One of the unique and interesting attraction is the Museum De Zwarte Tulip or Black Tulip Museum. A visit to the De Zwarte Tulp museum is a great way to learn more about the history of the flower growing regions of Holland. The museum displays breathtaking pictures of tulips along with artifacts on bulb cultivation, its origins, and development. Then there is the Sint Agathakerk a large roman catholic church. The interior has some remarkable stained-glass windows, paintings, and artworks. 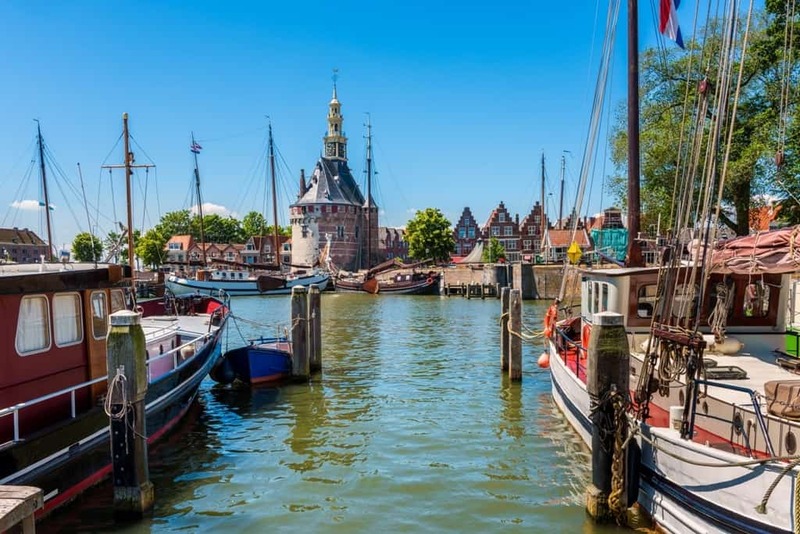 Hoorn is in a quick and easy train ride from Amsterdam. Thanks to the excellent port, it used to be an important trade center. Being off the beaten path, Hoorn strikes with authentic Dutch atmosphere, beautiful architecture, and superb restaurants. All that near the IJsselmeer lake. The main attraction in Hoorn is the West Frisian Museum (Westfriesmuseum) which houses a rich collection of paintings, Delft porcelain, silver objects, and firearms from the Golden Age. Furthermore, the building itself is one of the prettiest buildings in Hoorn dating back to the 17th century. Another famous attraction is the Museum steam train. It departs from Hoorn and runs through Medemblik and Enkhuizen showing the historic cities in North Holland. Walking around is easy and getting lost is recommended. Follow some of the picturesque cobblestone streets or take a walk along the harbor. There are beaches and dunes nearby perfect for any nature-lover. Hoorn is a great shopping destination. Besides all the well-known brands, there are some cute little boutiques and gift shops. If you look further you’ll find excellent antique stores. 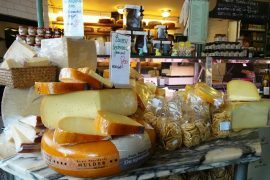 Moreover, there is a local market every Saturday and a Cheese Market Day every Thursday during the summer. 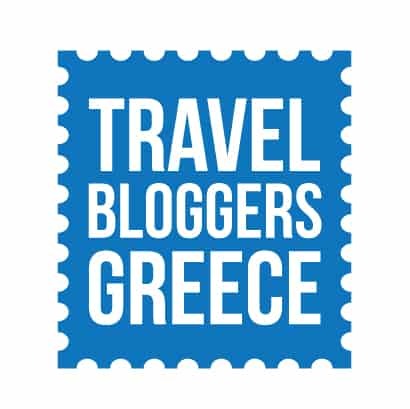 After a day of exploring and shopping have a rest in some of the beautiful terraces or a fine dinner in some of the restaurants. Domburg is a picturesque town in the province of Zealand, located at the North Sea. It’s also one of the oldest seaside towns in this Dutch province. Even though it’s just a small town, it’s definitely not a boring place in the Netherlands. 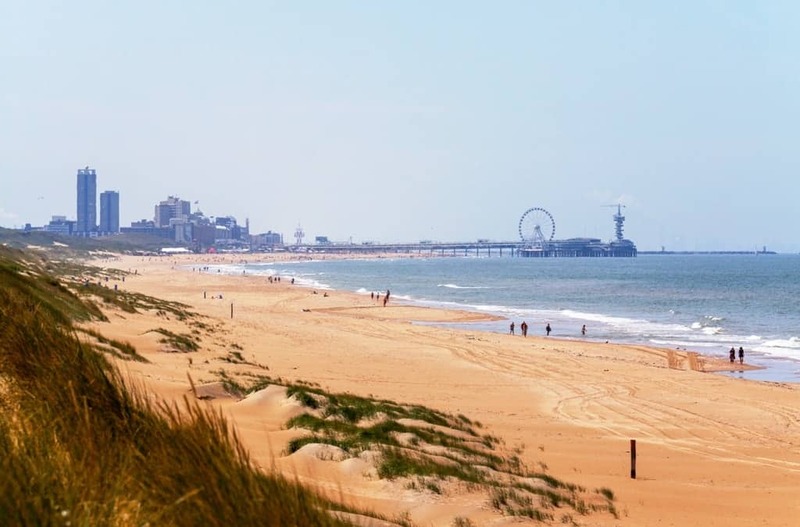 In Domburg you can explore the historical center of the town or have a day at the beach. 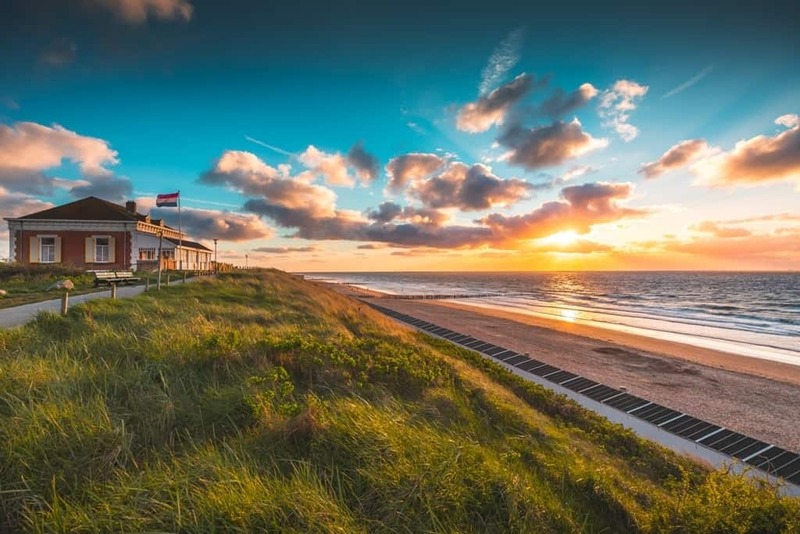 Because the main attraction is the beach, most tourists flock to Domburg in the spring or summer time. The center of the Domburg is located behind the dunes and is really nice to explore. Here you can find many cafes where you can sit down and enjoy some refreshing drinks! Besides relaxing on the beach or exploring the cute town center, you can also go for a day at a spa, yoga on the beach, visit the windmill Weltevreden and so much more! Just a short bus ride from Amsterdam, Volendam is a cute village to visit before hopping on the ferry to Marken. 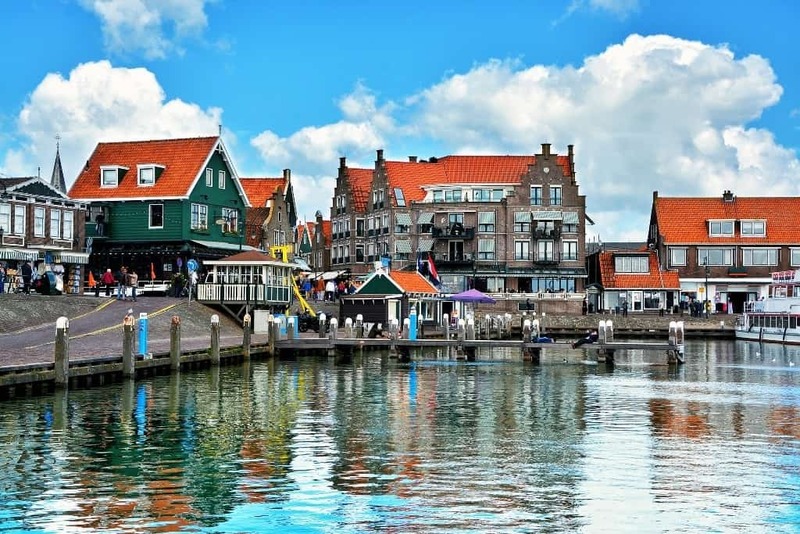 Volendam is a fishing village and bigger than nearby Edam or Marken (you can easily visit all three in one day). Parts of Volendam have more of a kitchy touristy feel but that’s part of what makes Volendam fun — and a great place for people watching! 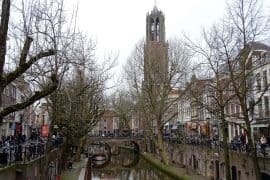 Start your visit with a stroll through the old town but be sure to veer off the main drag so you can explore the peaceful labyrinth of pathways and bridges between the very cute traditional Dutch houses. 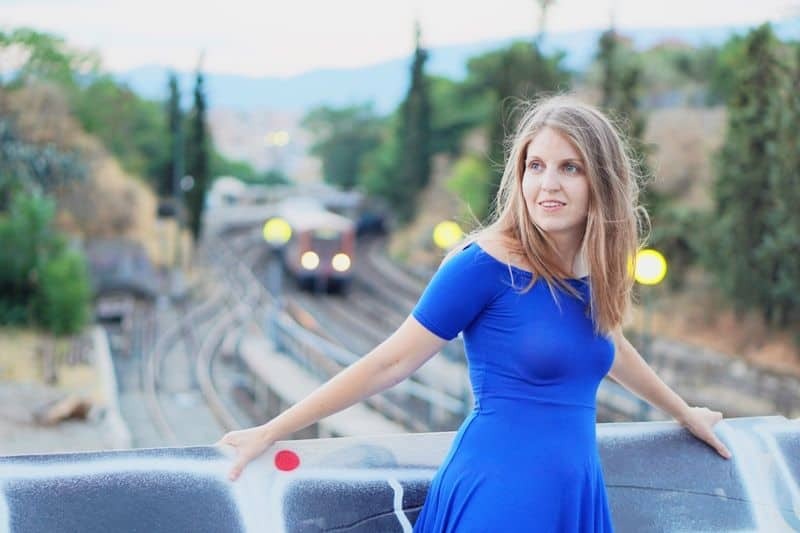 You can get some beautiful photos in this area! If you’re into museums (or just want to get out of the rain) you’ve got three to choose from: the Volendam Museum, the Palingsound Museum and eel smokehouse, and the Cheese Factory Volendam. Finally, head over to the lively promenade that lines the harbor. There you’ll find a variety of restaurants, photo shops that will take a picture of you in traditional Dutch clothing, and souvenir stores, as well as several take-away food stands (I had the BEST French fries in Volendam). You can catch the ferry to Marken from here or find a bench and enjoy the beautiful water view. Marken is a cute village in the province of North Holland which was separated from the mainland by a storm in the thirteenth century. This isolation and the fact that it was inundated quite often, marked the island’s character: its population made living as fishermen and built their houses on stilts to survive the tides. In the fifties, Marken was connected to the mainland again thanks to the construction of a dike and now the village receives many visitors. Despite the increasing tourism, Marken’s inhabitants have known how to keep their traditions intact and today it is a nice and picturesque place to spend some hours. I went to Marken by bike, during a day trip from Vollendam. The peninsula has a very small center crossed by some canals and with its characteristic wooden houses built on stilts, an architecture that cannot be found anywhere else in the world. Also, there is a small marina for the fishing boats and pleasure boats. Along the marina, you will find fish restaurants and small stalls selling cod or other Dutch quick eats so it won’t be difficult to fill your stomach. After the stroll, take your bike again (or hike) to visit the island’s photogenic lighthouse. Zaandam is a lovely town in the Netherlands, just a short bus or train ride from Amsterdam. During the Dutch golden age, it served as a large milling centre, and still today you can see many windmills in the area. In Zaandam, you can also find the impressive “lego” hotel and the surrounding buildings. 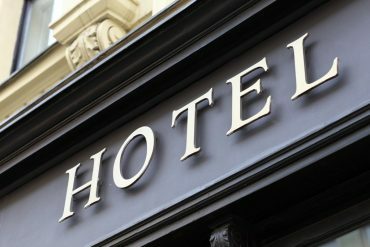 Right next to the train station, you will find inntel hotel with its spectacular and unique architecture. 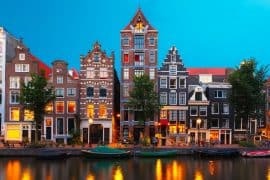 But all in all, it’s a quaint town that shouldn’t be missed out on while visiting the Netherlands. Notable places to visit are Zaanse Schans, Tsar Peter House, Kooijman Klompenmakerij, and Het Jonge Schaap. The quaint village of Wassenaar lies about 10 km nort-east of the Hague and is also home to the King of the Netherlands and his family! Need I say anymore? The village centre, which is very compact, can easily be explored on foot. Why not meander down the main street and discover the local shops, designer boutiques and indulge in one of Luciano’s famous homemade icecreams. It’s one of the best icecream parlours in Holland and is something of an institution! For something quintessentially Dutch, stop off at Broeders restaurant for a coffee and apelgebak (apple cake) or a delicious pancake at the Pannekoeken Huis. We particularly love the local beaches, Meijendel and Wassenaarseslag which are just a short bike or car ride away. The main beach, Wassenaarseslag, is a wide and sandy beach with views towards the Hague’s skyline. There are some great chilled-out beach pavilions where you can sample the local fayre – be sure to try a ‘broodje kroket’ or some ‘kipsaté’ (chicken satay). If you’re a thrill seeker, don’t miss Wassenaar’s amusement park, Duinrell. It’s set in a wooded area and caters to all ages, offering over 40 rides and attractions. 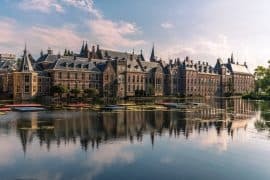 Wassenaar is not only a great base for exploring the pretty village and its beaches, but its location is fantastic for travelling a little further afield. Discover the Hague within 15 minutes, the picturesque town of Leiden (10 mins), Delft (20 mins) or Amsterdam (40 mins). As they say in Dutch ‘Geniet ervan’ – enjoy! 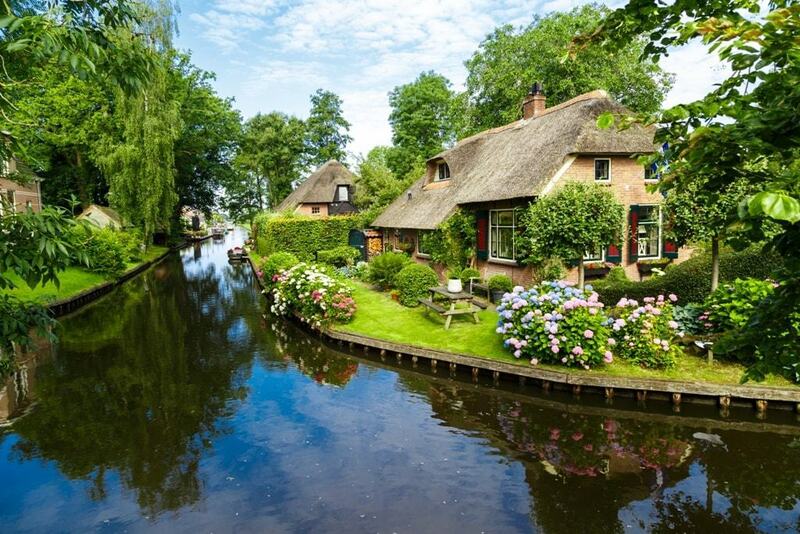 Giethoorn is one of the cutest villages in the Netherlands. This village in the Netherlands has no roads, only footpaths and canals, which means that you can float through the streets. The village was always quiet until it was featured in a Dutch movie and became famous on the global stage, especially in China. 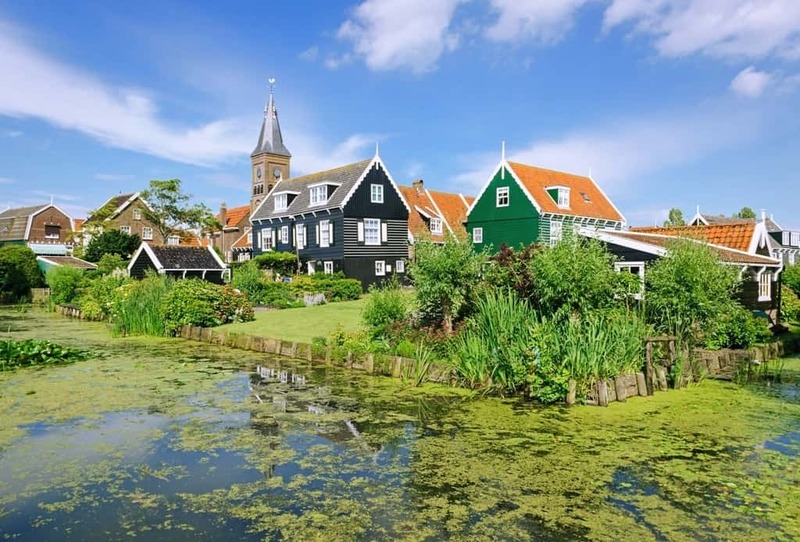 Now, over 800,000 people visit this picturesque Dutch village each year. Although I was concerned that the crowds would take away from it, it quiets down towards the end of the day and you can finally breathe. One of my favorite parts of visiting this village was renting a boat to float along the canals past the adorable houses, pastures full of sheep, and around the lake behind the village. While boating around the village, you can stop your boat to stop into any of the canal-side businesses for a beer or frites (we did!). Although overtourism is an issue in Giethoorn, I would still recommend it to tourists who are looking for an adorable Dutch villages. It’s not so easy to get here from Amsterdam by train as it’s in involved travel route, but I’d still recommend it for anyone who has a car. When thinking about the Netherlands, you might have little alleys, small canals and cute houses in mind. However, there is more – a rougher, but still romantic side of Holland, namely the entire area along the coast of the North Sea. My favourite village at the Dutch sea is, by far, Noordwijk. This tiny village is not only home to some of the country’s best hotels, but also to absolutely picturesque sunsets. It is the home of around 26,000 people and belongs to the province of South Holland. Also, it is located in an area called the “Dune and Bulb Region”. When I visited, I spent my days walking up and down the beach, watching seagulls fly around my head and surfers try their luck in the waves. I enjoyed the awesome food at restaurants such as the one at Vesper Hotel where drinks are actually suited to the colour of the room you are staying in. 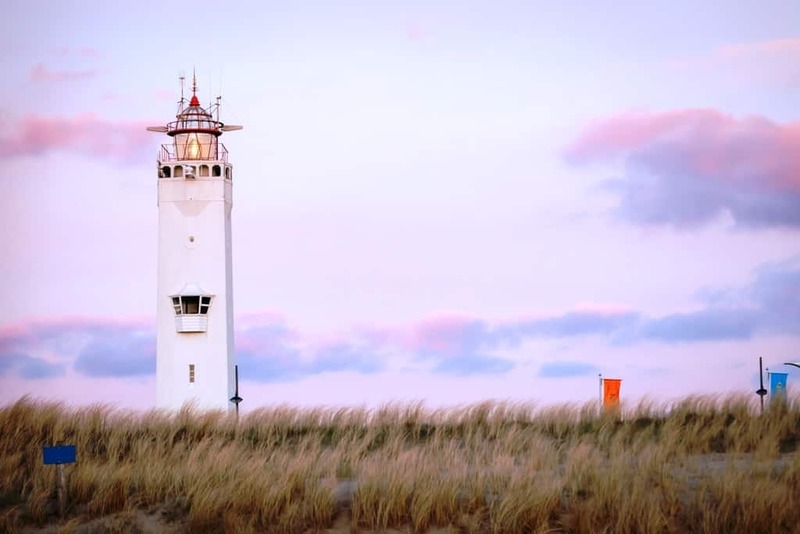 Other than that, Noordwijk is a great point to understand the Netherlands outside of the big cities and to see how locals pass their daily life – on bikes, in boats and while enjoying a glass of wine with views of the moving sea. Probably unknown to most foreign tourists but very well known to locals, Schin op Geul is a lovely village situated in the hills of South Limburg between Valkenburg a/d Geul and Maastricht. Schin op Geul is a great place if you enjoy walking the hills and forests of South Limburg and exploring a different side of The Netherlands. 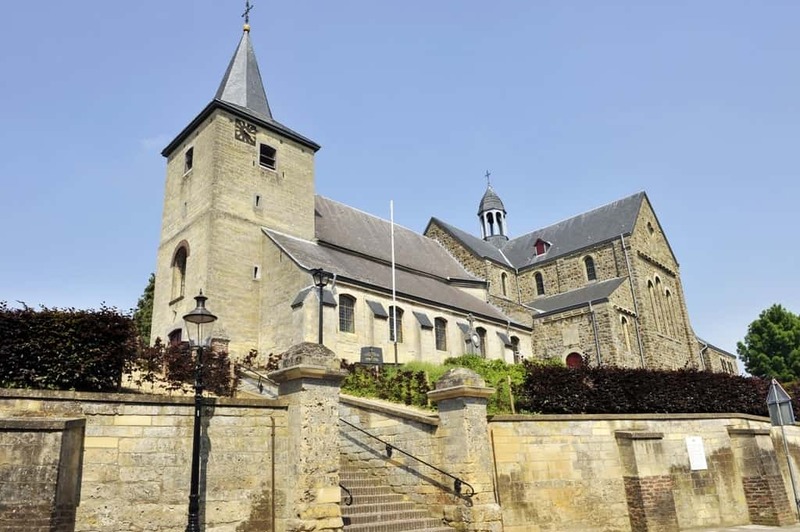 There are many castles and old churches to visit and of course, you can’t miss out on the local ‘Gulpener Beer’ that is brewed not too far from Schin op Geul. Another great attraction is the ‘3 country point’ in Vaals where you can put your feet on the boundaries of The Netherlands, Germany and Belgium. Maastricht must be one of the most beautiful cities in The Netherlands and it attracts tourists, visitors, students and expats from all over the world. 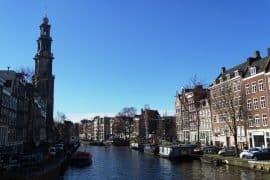 It is certainly one of the most stylish cities with beautiful boutiques, lovely terraces on historic squares like the ‘Vrijthof’ and a Roman bridge over the river Maas. Valkenburg is only 3 km from Schin op Geul. Here you can visit a former coalmine and many American visitors will be impressed by the Netherlands American Cemetery and Memorial in Margraten. 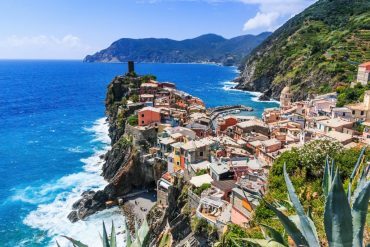 All of these places are incredible destinations to travel to. While these traditional villages are many in number, they are each unique in their own way which gives them all their own specific charm. You’ll be able to not only learn about the history of the interesting cottages and farmhouses situated in them, but walk along stone bridges over winding canals, see flourishing gardens, and experience the magnificent spirit of the Netherlands while exploring them. 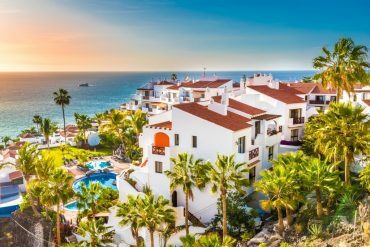 If you plan to visit this country, you’ll definitely want to keep a tour of these villages on your itinerary. Previous articleWarsaw or Krakow? Which one to visit?